My dad is a big fan of seafood and will go to great lengths to find the good stuff, particularly if it’s crab or lobster. So, when he proposed driving down to South San Francisco for this ‘truck,’ I was intrigued. I’m pretty food truck fatigued, but figured this had to be something special if we were going to make a drive out here. 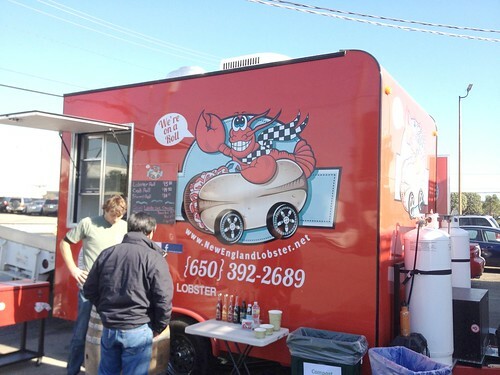 The New England Lobster trailer is only a couple months old, an extension of a large retail and wholesale seafood company (the largest lobster wholesaler in California). It’s parked right outside the company’s storefront, where they sell fresh lobster, crab and other seafood year-round. Direct from the source…perfect. It’s actually the place where my dad gets the lobsters for Thanksgiving and Christmas dinners and presumably this is how he stumbled upon the trailer. The menu is fairly brief…focused, I should say. They make only a few things and they make them well. 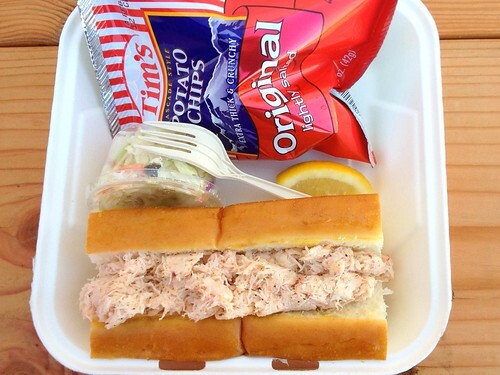 The rolls are $10-$15.50 which is a bit more expensive than typical food truck fare, but hey, it’s fresh crab and lobster. They definitely have a competitive advantage in terms of their seafood pricing and it’s rather no-frills eating; you’re really getting a lot of value out of those dollars. It was a little chilly out, so I started with a bowl of soup. 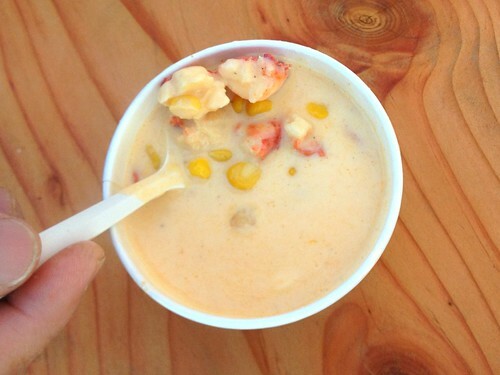 Rather light and creamy, the soup had a nice sweetness both from the corn and lobster. It was kind of like a lobster bisque; there was definitely a lobster/shellfish stock base. I was a little fearful that the lobster would be overcooked in the hot soup, but my fears were assuaged as I bit into the plump and juicy pieces. Nice! Now, what we were most looking forward to. The roll was generously sized, about 8 inches long and packed with Maine lobster. The bread was toasted and soft, while the lobster was lightly dressed in what I think was just mayo, salt and pepper. Quite simple. The sweet lobster had the spongy, springy texture I was expecting and was quite tasty, especially with a splash of lemon. Served with potato chips and coleslaw, but I didn’t think they were even necessary. Though, it’s hard to go wrong with some simple potato chips with a sandwich like this. 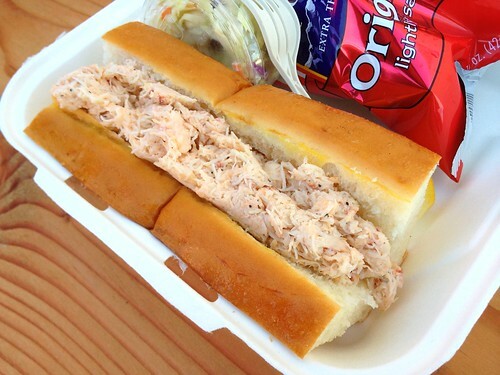 Similar to the lobster roll, this one was filled with a good amount of fresh crab. I don’t think it was dressed in anything. I personally prefer lobster over crab so I liked that one better, but this roll was equally well-executed. 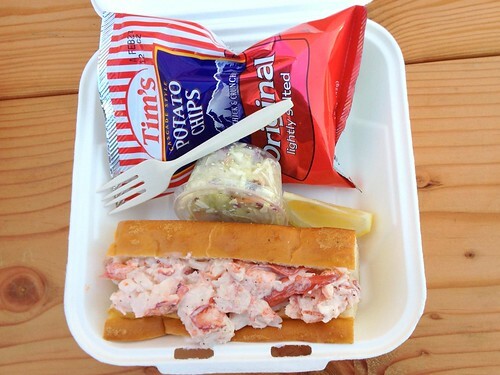 I think the potato chips were more important with this sandwich to add that crunchy texture, since crab just doesn’t have the springy bite that lobster does. Given this was just after dinner at Saison the night before, I was ready for some sort of letdown but it wasn’t found here. The food exceeded my expectations and was quite good for any restaurant, let alone a trailer. The seafood is, expectantly, very fresh and simply prepared; the quality of the seafood really came through. My only regret was not taking any fresh seafood home with me. Right now, the trailer can only be found parked outside their marketplace. However, once the staff hits its stride, I suspect we may be seeing them soon in other locations on the peninsula and in San Francisco proper. In my opinion this would have to be a marquee option, especially when pitted against other mobile vendors. Looks delicious! 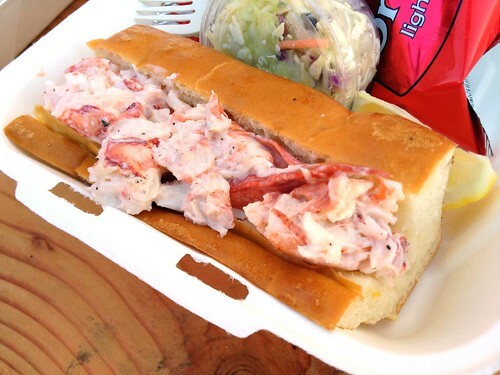 How does it compare to the Lobstatruck here in LA? Haven’t tried the lobster roll there yet (only clam chowder) but I’ll let you know when I do! 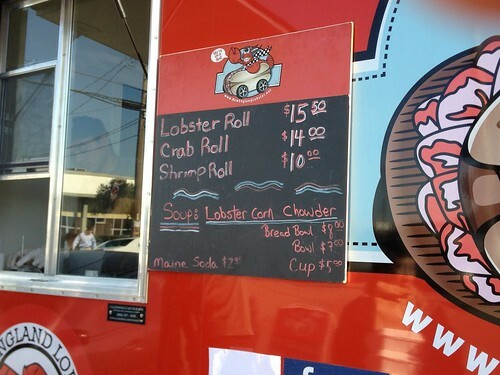 We should have tried the Lobsta Truck when we were at Eagle Rock Brewery. Oh wells. Next time. I really want to know how it compares to Luke’s Lobster in NYC. Haha yeah, but we had more than enough food that day. What are the chances of your dad starting a food blog? I think it would be a HIT! I heart lobster rolls. So much. Haha not likely at all. Wish you could’ve tried this one!